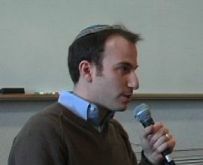 During Chanuka, alumnus Ethan Isenberg ('99 PC) Director/Producer of the documentary film "Lonely Man of Faith: The Life and Legacy of Rabbi Joseph B. Soloveitchik", offered to screen the film for overseas students at Yeshiva. 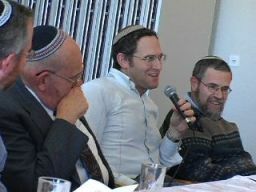 The next day, a panel discussion was held with Rav Ezra Bick, Rav Elyakim Krumbein, Rav Mosheh Lichtenstein and Rav Reuven Aberman (father of Rav Moshe Aberman), which was moderated by Rav Reuven Ziegler, and included brief comments by Ethan Isenberg. 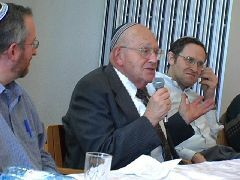 According to Rav Yair Kahn, who organized the event together with Craig Lubner, each of the panelists described the impact of the Rav zt"l from differing angles by recounting personal experiences and focusing on the importance of the Rav's legacy today. The students, who asked questions at the end, gained a sense of the greatness of the Rav and a thirst to study more. 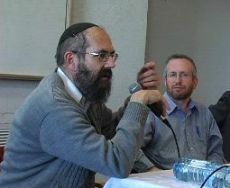 "The Rav's departure from the scene created a vacuum in the centrist Orthodox world," explained Rav Kahn. "For those following in the Rav's path, it gives direction and purpose to anchor oneself in such a Gadol." "I am tremendously grateful to the Yeshiva for all its assistance in the making of the film," remarked Ethan Isenberg. "It is at the Yeshiva that I first began exploring the Rav's writings, and over the course of the film, I was able to turn to Harav Lichtenstein and a number of Ramim for advice. I appreciate the help of the overseas office in coordinating my interview with Harav Aharon and I'm most indebted to Reuven Ziegler for providing me with crucial guidance throughout the entire project."